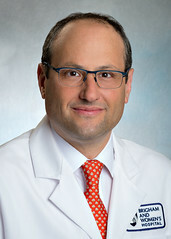 Associate Editor, Dr. John Saltzman, MD, FASGE, highlights this article from the February issue “Effect of scheduled second-look endoscopy on peptic ulcer bleeding: a prospective randomized multicenter trial” by Soo Jung Park, MD, PhD, et al. Rebleeding remains an important cause of morbidity and mortality among patients undergoing endoscopic therapy for upper GI bleeding. Second-look endoscopy is the practice of performing a routine second endoscopy 24-36 hours after the initial endoscopy and providing further endoscopic therapy if high-risk stigmata of hemorrhage persist. This technique has been shown to reduce further bleeding; however, it has been mainly studied in patients undergoing injection monotherapy (which is not recommended as it is not as durable as combination therapy with cautery and/or hemoclips). These authors performed a multicenter, prospective, randomized controlled trial in 319 patients with peptic ulcers high-risk bleeding sigmata. Overall, the patients randomized to a routine second-look endoscopy (and endoscopic treatment of any persistent high-risk bleeding stigmata) did not have reduced rebleeding. 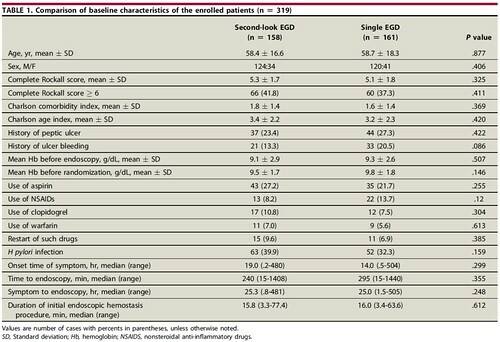 However, the authors did find an increased risk of rebleeding in their multivariate analysis in certain patients, including those with a “grades 3 to 4 of endoscopists’ estimation of success of initial hemostasis.” Definitions of grade were 3 (relatively unsatisfactory [probably need second-look EGD to prevent rebleeding]) and 4 (absolutely unsatisfactory [definitely need second-look EGD to prevent rebleeding]). This paper further expands our understanding of the factors that contribute to rebleeding after endoscopic therapies, as well as the potential value of performing a second-look endoscopy in select patients. Patients who have high-risk upper GI bleeding need to be identified and treated with highly effective endoscopic therapies including over-the-scope clips and/or methods to determine the effectiveness of endoscopic treatment such as Doppler probes. Second-look endoscopy should be considered in those patients with significant upper GI bleeding in which we are not confident about the effectiveness of our endoscopic therapy.